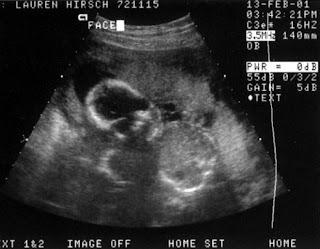 Smiling Happy People: Detailed Ultrasound; It's a GIRL?! Detailed Ultrasound; It's a GIRL?! 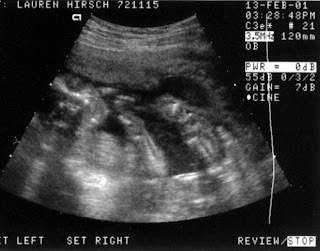 Lauren has her detailed ultrasound, from which two pictures are available here. The first is a picture of the baby's face and the body, and the second is a closeup of the face. Everything looks great, the baby is 12.5 oz, and might very well be a girl. The doctor and the technicians all say she's a girl, but aren't willing to say for sure. Lauren goes and eats something and walks around for a while in hopes that the baby will turn around for a better view, but no such luck. 80% sure she's a girl, but nobody knows for sure. If so, we've got ourselves a little Abigail Zoe (Dovrish Zeva).